What Is Light Therapy for Hair? LLLT is a non-invasive Low Level Light Therapy for hair loss. These LLLT devices emit low power red light in the wavelength of 635-655 nm. LLLT for hair growth in both men and women appears to be both safe and effective. How Does It Work On Hair Loss? The main mechanism is hypothesized to be stimulation of stem cells in the hair follicle and shifting the hair follicles from telogen phase i.e.resting stage, into anagen phase, i.e. the active and growing phase. It changes the hair cycle pattern from thin vellus hair to thick terminal hairs. It also decreases the stress factors around the hair follicles, with increase in local blood flow and local growth factors influx. How Many Sessions Are Needed For Results To Appear? Results vary from individual to individual. Usually it takes 12-16 week period to see gradual improvement. It requires minimum of two sessions per week, with each session lasting 30-40 mins. Can It Be Combined With Other Topical Agents? Yes, LLLT is a very safe and effective if combined with other topical solutions such as minoxidil (2%-10%), caffeine based solutions, stem cells, etc. It can also be combined with other procedures such as micro-needling and derma pen procedures for earlier response. What Is A Derma pen? A derma pen is a motorized surgical instrument which has a disposable cartridge tip outfitted with micro-needles. The length of these medical grade needles vary from 0.5-2.5 mm. How Does It Work In Hair Loss and How Many Sessions Are Needed? Derma pen has inbuilt motor, which causes the micro-needle in the cartridge tip to oscillates at high speed and puncture the skin causing controlled micro-trauma. These micro-trauma attract increase blood flow in the skin during healing phase alongwith increased growth factors in the area involved. This leads to activation of latent stem cells in the hair to regrow and multiplicate. Moreover, it leads to the dihydrotestosterone level decrease in the local surrounding area of hair bulb with increased blood flow. In androgenetic alopecia, it is found there is increase in the DHT levels and its receptors in the hair follicles of the scalp. Thus, with derma pen, the changes are occurring at the cellular level and can be seen only after successive 5-6 sessions. What Is The Downtime With Derma Pen Procedure? It is an office based procedure. Since it causes controlled micro-trauma consisting of uniform depth channels, the recovery time is minimal with 1-2 days, with no or minimal bleeding. A derma roller is a basically, a handheld device with a wheel attached to a handle. The wheel is outfitted with tiny needles, ranging from 0.5 to 2.5 millimetres long. The device is rolled over the skin, causing the needles to press against the tissue and cause channels of microtrauma with normal skin tissue between each channel. These microtrauma causes the blood flow to increase in the involved area for the healing process, which in turn increases the availability of local growth factors to come in contact with the hair follicle bulb and bulge area. These area contain progenitor stem cells which on being activated by the various growth factors start proliferating, and replacing the old thin hair into thick terminal hairs. Minimum of 5-6 sessions are required for the results to appear. These sessions can be carried out with a gap of 4-6 weeks. There are many times, when an individual cannot go for hair transplant, or the other modalities have been repeatedly failed or when there is a localised patch with scarring which cannot result in regrowth of hair. In these conditions, procedure such as medical micro-needle tattooing can be under taken. These micro-needling tattooing machine are outfitted with medical graded disposable needle cartridge (from 3 needle- 7 needle cartridge) with imported dyes being used with it. First, base color is matched with the surrounding hair color with a test patch in the area to be taken up for tattooing. Patient is asked to follow up in 7-10 days, and the test patch is evaluated. If the color is matching and there is no adverse reaction to the color, the selected dye is taken up for the procedure. The area selected is marked with marking pen, and anaesthetic cream is applied. After sterilizing the area, procedure is started. There can be minor discomfort during the procedure, with anaesthetic cover providing the least possible pain. There can minor pin-point bleeding. Results can be seen in 1-2 weeks time after the redness has settled down. The main outcome of the procedure is to give the scalp fuller appearance. Why Skin & You Clinic for Hair Loss Treatments? 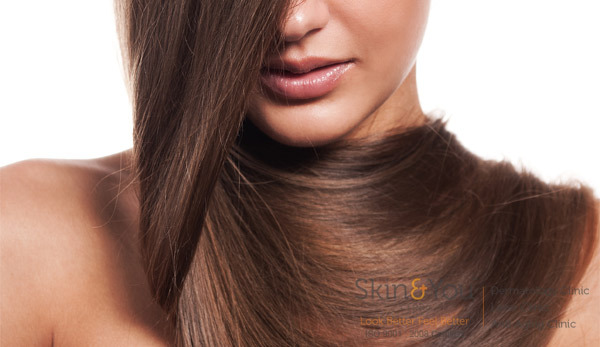 We at Skin & You Clinic use a combination of treatment approaches to help in hair regrowth. In the first month of sessions you will see the hair fall getting better, by second month some change in the hair growth is noticed and by the end of 3 months changes are visible. But the changes are not temporary. In cases where no treatments have worked medical tattooing of the scalp is a good option.